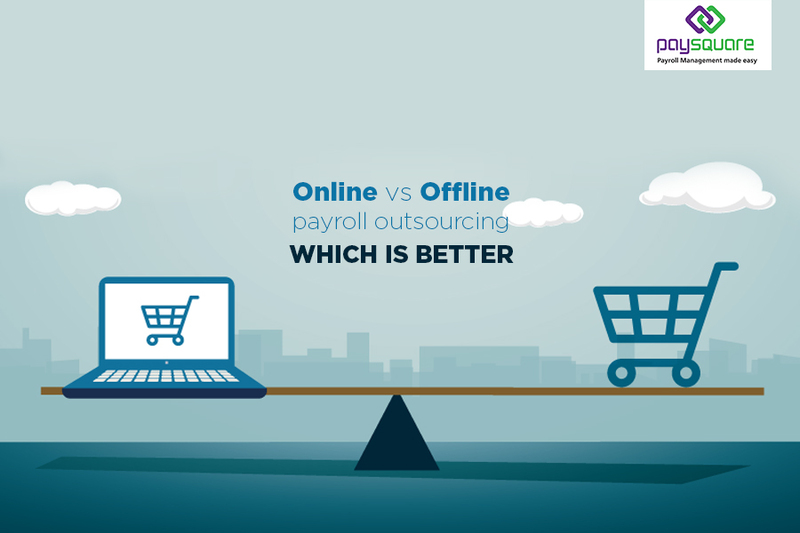 Online payroll outsourcing vs offline payroll outsourcing. which is better? More than anything many companies are looking to improving the efficiency within the workplace. They are now increasingly outsourcing business processes such as payroll to third-party providers who can perform those functions more efficiently. The penalties for not complying with government rules and compliances is more expensive than the cost for payroll. However, with both offline and online payroll outsourcing services, companies have a tough time determining which type of payroll provider could be the right choice for them. Thus we have listed some of the benefits of both to help companies consider when deciding to outsource their payroll services. Online payroll software enables the company to complete all payroll processes in much more quicker way as opposed to hours using manual processes. The system helps to easily calculate salary based on hours, overtime and bonuses, and at the same time it efficiently keeps track of paid time off (in companies where this applies). It helps to free employees from performing mundane tasks and enables them to focus on more important and productive things, like growing the business. Online payroll ensures that everything can be done in real time and as long as you have a working net connection, it can be done at any point of time and from anywhere. Managers also get to enjoy the ease and cost-effectiveness of operating in a real time, web or PC environment. Direct deposit is much more preferred way of getting salary as it helps employees gain immediate direct access to their funds. Typically they had to wait for several days before the funds could be cleared. It also eliminates the need of having the employees drive to their bank to deposit their check. Which means a significant reduction in commuting that saves fuel and as reduces pollution. All benefits that are provided by the company can be easily viewed by the employees on an online employee portal. They can get access to details like checking leave balance, review their status of medical claims and a few other important processes. It eliminates the need to consistently get in touch with their managers or HR for these details and subsequently saves a lot of time of both employees as well as the managers/HR. Online payroll services are designed in such a way that newer staff members will find it easy to learn and get comfortable with it as opposed to complicated in-house manual processes that often lacks clear and precise guidelines. Employees are known to change their jobs on a frequent basis. Thus online services need to be easy to use as it significantly shortens the learning curve for new recruits. Payroll outsourcing companies understand that to provide efficient and on-time payroll services to their clients they need to adopt the latest software programs for payroll processing, tax computation so that they can significantly minimize all errors as well as delays. By outsourcing payroll to the experts, companies get to improve their productivity by saving time, efforts and costs incurred that are usually wasted on carrying out payroll operations in-house. They provide a wide range of comprehensive payroll services for different industries that give them a considerable amount of edge as compared to in-house processes. With in-house manual payroll processing, there have been many errors like salary overpayment or errors in tax deduction that need to be addressed at the earliest. While these errors may appear to be small, their ramifications can be huge for the company right from inviting penalties from the government to hampering their reputation in the market. When it comes to outsourcing payroll services, the very question that companies have is whether their data will be kept secure and confidential. There could be incidents such as payroll executives absconding, identity theft, tampering with business-critical records for personal gain, etc. Payroll service providers take utmost care to make sure such incidents do not take place. There are pros and cons to both the methods. Some organizations have found success with offline payroll service providers while some have found it with online payroll software. It is ultimately the company’s decision on which method to finalize based on their needs at that point of time. Eventually outsourcing payroll is sure to lead to considerable cost and time savings, improved data security, better compliance, access to experts and better reporting.